At West Gate Dental, we proudly provide high-quality dental treatments and care to patients from our Lincoln, Nebraska office. Dr. Rebecca Sowers and our highly-trained treatment team strive to provide personalized, individualized care, working to understand each patient’s unique dental situation and create treatment plans that fit with each patient’s lifestyle. We offer a variety of treatments including restorative, general, and cosmetic dental treatments, but one of the most effective and versatile procedures we offer at our office is dental implants. Dental implants are a revolutionary procedure in modern dental medicine, providing one of the most effective and long-lasting ways to replace teeth. A minor surgical procedure, dental implants are a convenient and low-impact way to repair a smile missing teeth, and we can use implants to replace one tooth, multiple teeth, or an entire dental arch using implant supported dentures. 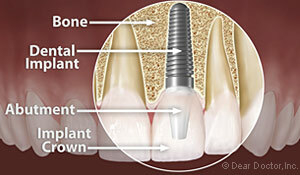 Usually, dental implants are composed of a small, screw-like titanium post, which fits into the socket left by a tooth root and replaces that part of the missing tooth. A local oral surgeon places the implants using a minor, routine surgical procedure, often requiring no more than a local anesthetic to keep you comfortable during the procedure. After they place the implant, we’ll take a short waiting period for the implant to heal and fuse to the bone, then our office will top the implant with a natural-looking dental crown that’s custom shaped and color-matched to replicate the look of your natural teeth. Dental implants come with a success rate of some 95%, making them one of the most effective tooth replacement procedures in modern dentistry. 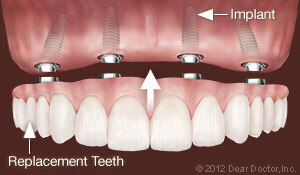 Why Are Dental Implants Effective? What makes dental implants such a unique treatment is the fact that titanium possesses an extremely unique property: osseointegration. This means that when the titanium post is inserted into the jawbone, the bone will literally grow into and fuse with the titanium over time, providing an incredibly sturdy and durable foundation for the replacement tooth. Thanks to this integration, dental implants can dissipate bite force across the whole jawbone just like a natural tooth would, providing a robust support and helping to prevent problems like bone loss down the line. 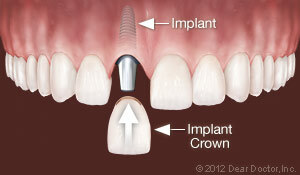 If you’re missing a single tooth, we can place one implant into the socket of that tooth’s root. This treatment has an extremely high success rate, making it an excellent investment compared to other options. While the upfront cost of an implant is higher than some other options like bridges, the longevity and success rate of dental implants generate significant savings over the life of the implant. If you have a number of teeth missing, dental implants can restore your smile completely, giving you the healthy & beautiful smile you deserve. In many cases, we don’t necessarily need to use a one implant for every missing tooth: with implant-supported dental bridges, we can replace multiple teeth with relatively few implants, helping to lower treatment costs while still getting all the benefits of implants. This also has the advantage of not needing to use crowns on other teeth for support, helping to preserve your healthy natural teeth. 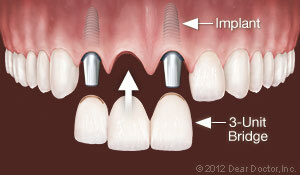 We can also use implants to replace an entire dental arch (i.e. 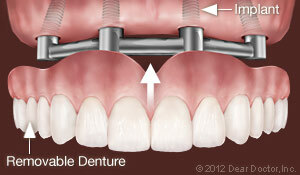 all your upper or all your lower teeth), and we can even use them to replace all of your teeth completely. Implant supported dentures provide a durable, long-term option for completely revitalizing your smile, and thanks to the osseointegration of titanium, implant supported dentures don’t come with the same risk of bone loss as regular dentures. We can often use only 5 or 6 implants to replace all the teeth in a dental arch, and your new teeth won’t slip or cause problems like traditional dentures do. If you wear dentures, you know the difficulties they can cause – but implant-supported removable dentures offer a solution that’s more comfortable, effective, and healthier for your jaw. Because traditional dentures rest directly on the gums, they unnaturally apply biting pressure directly downwards onto the jawbone. Over time, this can accelerate bone loss and undermine the integrity of your smile. Implant-supported removable dentures solve this problem, creating a comfortable and highly-effective treatment option that can last a lifetime. Implants have an extremely high success rate, and there are only two factors that may cause an implant to fail after it’s successfully fused with the jaw: poor oral hygiene or excessive bite forces. Proper oral hygiene is important for maintaining your implants, as failing to maintain oral hygiene can cause gum disease and lead to a highly destructive form of bacterial infection called peri-implantitis. No matter what form of implants you get, it’s important to regularly brush and floss your teeth as well as schedule regular professional teeth cleanings. In addition to hygiene, certain patients habitually use excessive force when they bite or grind or clench their teeth (bruxism), which can cause problems with dental implants. We’ll work with you to choose a number of implants that can support your bite forces, and in the rare case that bite forces become a problem, we can recommend exercises or provide a night guard that protects your implants. If you have one or more missing teeth and have been wondering how to reclaim the smile you love, dental implants may be the solution. Call us today at 402-475-8710 with any questions you still have about implants, and if you’re ready to schedule a consultation, you can request one using our easy online form. We hope you’ll consider dental implants as a reliable, cost-effective, and comfortable option for replacing teeth, and we look forward to helping you achieve the healthy, beautiful smile you deserve!